All of the various forms of self-deception or prelest fall into two categories . . . The first kind often ends in insanity and suicide. The second, although it more rarely ends so tragically, is nonetheless just as ruinous. 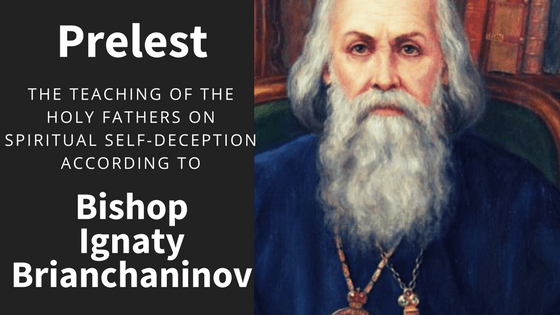 The path to spiritual transfiguration, and indeed the search for truth on any level, meet with obstacles – not so often a direct opposition as a subtle, Satanic allurement – of which every Orthodox Christian should be aware. All of the various forms of self-deception or prelest fall into two categories and proceed, first, from defective activity of the mind, and second, from defective activity of the heart (feeling). “It is foolish pride to desire and strive to see spiritual visions with mind not purified of passions and not renewed and recreated by the right hand of the Holy Spirit, it is the same kind of pride and foolishness for the heart to desire and strive for the enjoyment of holy and Divine feelings, when it is still completely unfit for them” (Bp. Ignaty). “Fancy,” in various degrees, is to be found everywhere: “Everyone who does not have a contrite spirit, who recognizes any kind of merit and worth in himself; everyone who does no hold unwaveringly the teaching of the Orthodox Church, but on some tradition or other has thought out his own arbitrary judgment or followed a non-Orthodox teaching – is in this state of prelest. The degree of prelest is determined by the degree of deviation and obstinacy in deviation” (Bp Ignaty). In the fallen state, out of all feelings only one “can be utilized in invisible worship: sorrow for sins, for sinfulness, contrition of spirit . . . Sacrifice to God is a contrite spirit: a contrite and humbled heart God will not despise (Ps. 50:17)” (Bp. Ignaty). “The monk agreed. In a few days he came to me and said: ‘what have you done to me!’ ‘What is wrong?’ ‘Well, when I tried to pray with attentiveness, confining the mind in the words of the prayer, all my visions disappeared, and I can’t get them back any more.’ Conversing further with the monk, I did not see that boldness and self-reliance which were noticeable in him during our first meeting and which are usually to be noted in people who are in a state of self-deception, supposing themselves to be holy or to be progressing spiritually. The monk expressed a desire to hear my poor advice. When I advised him not to distinguish himself in appearance room others, since that leads to self-conceit, he took his chains off and handed them to me. In a month he came to me again and said that the heat in his body had ceased, that he was already needing warm clothing, and that he slept a great deal more. At the same time he said that on Mt. Athos many, even among those enjoying a reputation of holiness, use the method of prayer which he had used, and teach it to others as well” (Bp. Ignaty). [Orthodox Word] Editor’s note: This example of prelest cited above, taken from the monastic life, should not lead one to suppose that it is a danger only to monks and ascetics: it has a powerful influence as well at very elementary levels of the spiritual life. In the additional selection below from the same essay, Bp. Ignaty describes the deceptiveness of the IMITATION OF CHRIST by Thomas a Kempis, a Catholic religious manual still very popular in the West, although now considered “old fashioned” by Catholic modernists who have advanced to other forms of prelest. All citations from On Prelest in Vol 1 of the complete Works of Bishop Ignaty, St. Petersburg, 165, pp 132-148. In antiquity, a king would send a special court dress to those invited to his banquet. In the parable of the Saviour, the wedding clothes symbolize the grace of the Holy Spirit sent by God to the ascetic. Archim. Prof. Cyprian. “The Spiritual Forerunners of (St) Gregory Palamas,” in Theological Thought, 1942, p 113. The Orthodox Word, Vol 1, Issue 4, July-August 1965, pp 155-158.